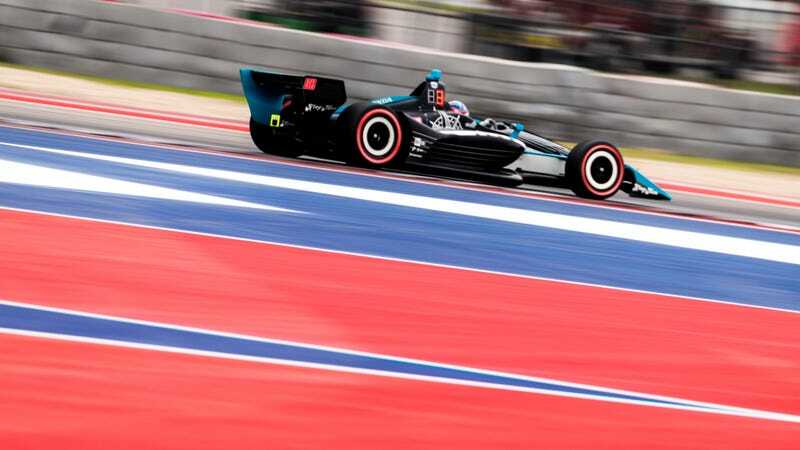 In a race that saw dominant driver and pole sitter Will Power retire with a few handfuls of laps to go, rookie Colton Herta won his first-career IndyCar Series race in the series’ first trip to Circuit of The Americas on Sunday. The victory makes Herta, who turns 19 later this month, IndyCar’s youngest winner. Herta, racer Bryan Herta’s son, is the only 18 year old with a victory, since IndyCar’s previous youngest winner was a 19-year-old Graham Rahal in 2008. Herta, who led the field on the final restart of the IndyCar Classic at COTA and didn’t give it up, won in his third-career race—his only two previous IndyCar starts were a race in 2018 and the series’ season opener St. Petersburg, Florida earlier this month, where Josef Newgarden won and Herta finished eighth. The win puts Herta second in series points behind Newgarden, and unofficial race results are here. Herta pulled out to a huge gap over the field after inheriting the top spot and leading to the green with 10 to go, with the restart stemming from an incident involving Felix Rosenqvist. He eventually won over Newgarden by nearly three seconds, with Ryan Hunter-Reay, Rahal and Sébastien Bourdais finishing out the top five. Radio communications soon reminded Herta to thank his various sponsors and partners, as race-car drivers famously do. But the IndyCar Classic didn’t look to be Herta’s to win—or anyone else’s, really—for most of the race. Power started on pole and dominated the event, leading every lap until he pitted toward the end of the race. Power stalled his car in the pit box, unable to move as his team sat and worked on it. In a scene so dramatic it almost looked scripted, Power would try to get the car going, shake his head, and wait for his crew to attempt another fix. At one point, the car made it a few feet before the head shaking commenced. Power’s team gave it one more try with a group push, but the car could only move under their power. When Power climbed out, he told the television crew that if “the yellow didn’t get us, the driveshaft did.” He finished 24th of 24. Plenty of other drama occurred, from IndyCar’s decision not to enforce track limits, to incidents on pit lane, to driver Zach Veach off-roading his car on the first lap of the race. But Herta made it through, and did so in front of everyone else, making him the series’ youngest winner. But when he climbed out of the car, Herta didn’t quite run down his whole list of partners. Instead, he said he needed a nap.